Are you a pie baker? It seems that many bakers have a specialty, perhaps cake decorating or cookie baking. I enjoy baking pies but don’t take the time to make them except on the holidays. 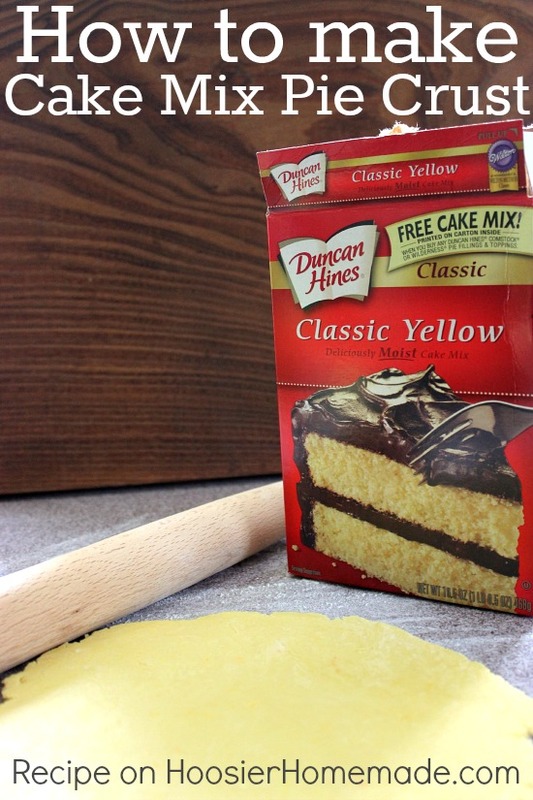 While I love the traditional pie crust, and even graham cracker crust, during a recent to Duncan Hines headquarters I learned about a new pie crust made from a cake mix. It’s super easy to make and taste really good too! Note — This pie crust is to used for fillings that do NOT need to be baked. This is a pre-baked pie crust. The flavor combinations are endless. 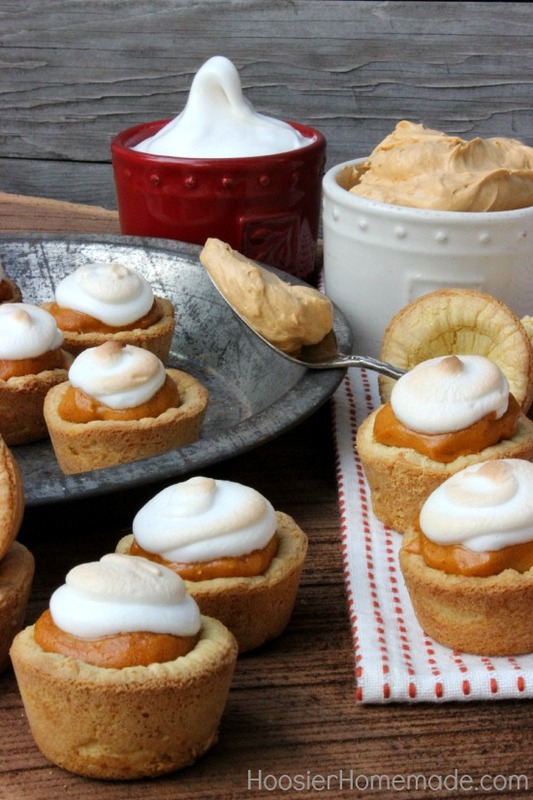 Today I’m using a yellow cake mix and paring it with pumpkin mousse for a Fall treat. 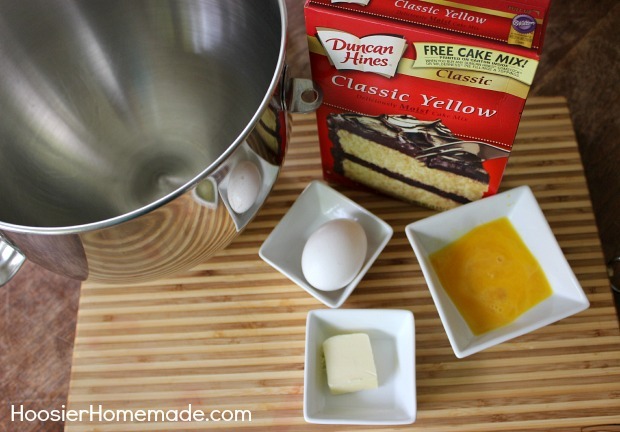 To make the Cake Mix Pie Crust you will need a cake mix, 1 whole egg, 3 egg yolks and 1 tablespoon butter. 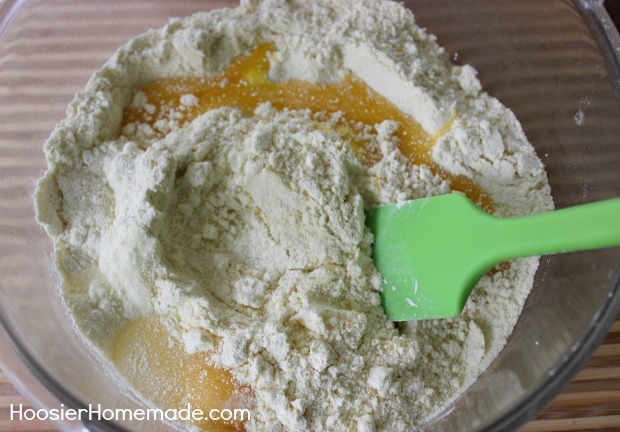 Sift cake mix: This step is not totally necessary, but I have found it helps a lot in combining the cake mix. 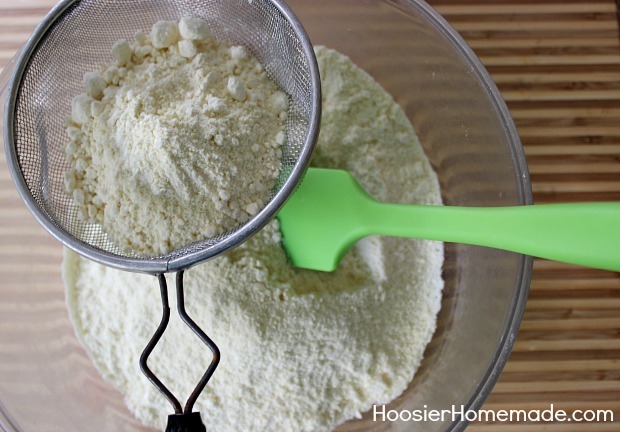 I actually sift every cake mix I use (this is my go to sifter! ), even when I’m baking cupcakes. 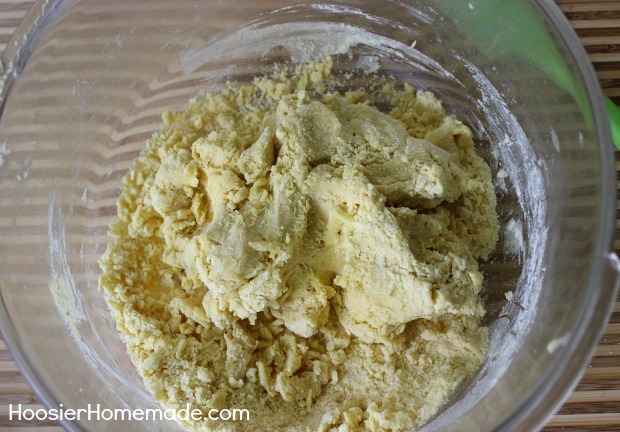 Combine: Mix the pie crust until the mixture begins to stick together. 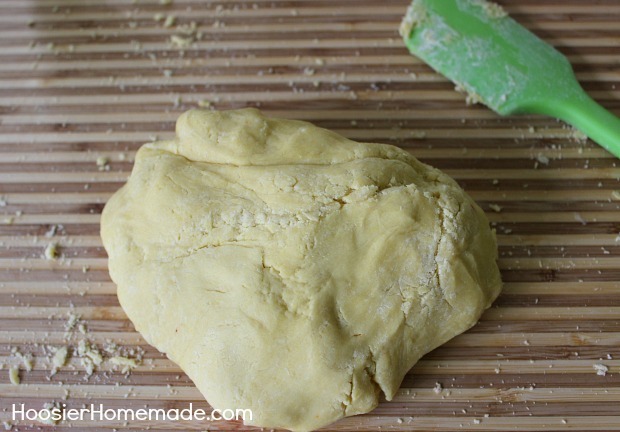 Knead: Turn the mixture onto the counter and gently knead until all the ingredients are combined. You can now wrap it in plastic wrap and place in refrigerator to chill or use right away. It’s best to chill though. I chilled mine for about 15 minutes to make it easier to handle. 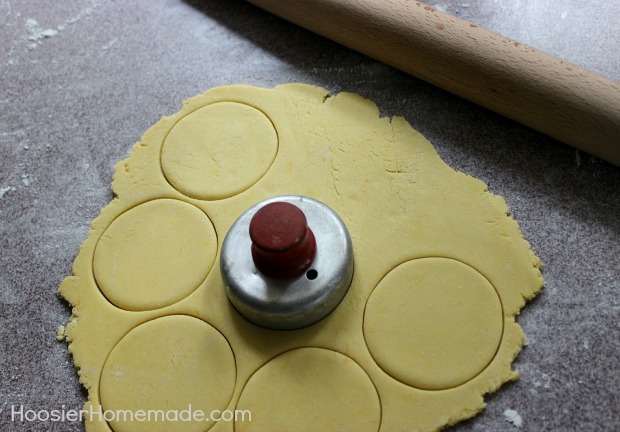 Rolling: Sprinkle the counter with a small pinch of flour and roll out the pie crust (make sure you have a rolling pin). You can make small pies like I did this time (this is a great set for all sized pies! ), or divide dough in half and make 2 regular pie crusts. Me too! Sign up now for a FREE recipe guide for every season! Is that butter cold? or room temp? Hi Roxie, the butter is softened so either way is fine. If it’s cold, just softened it a bit in the microwave. Do you mean any type of cake mix? Yes you can. Yes you can. Try a lemon cake mix for a Lemon meringue pie, chocolate for a chocolate cream pie, strawberry for a fresh strawberry pie. The ends are limitless. Great website!! Thank you! I can’t wait to try this with my gluten-free mix. You can certainly change the flavors of crust and filling. And yes, you need to keep them in the fridge. I’ll bet a lemon crust would be good for a Lemon Meringue Pie, or a strawberry crust for a Fresh Strawberry Pie. This is such a fun idea Liz – I love it! 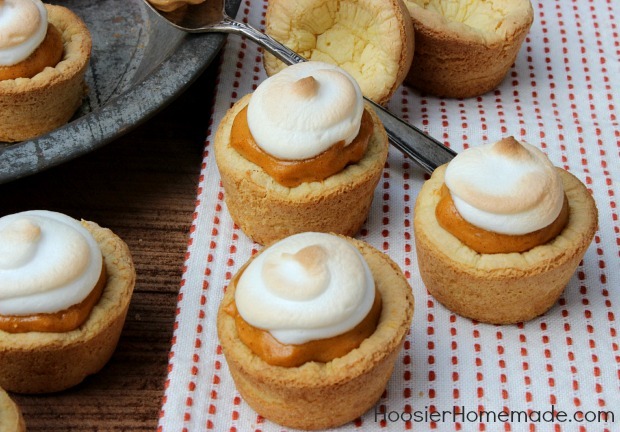 Did you use a muffin pan for these? where can i find pumpkin spice instant pudding not in canada itried the states got it last year but never can find it now please lrt me know …. Hi Annette, most grocery stores should have the pumpkin spice pudding. If you can’t find it, you can use vanilla pudding and add 2-3 tablespoons of canned pumpkin. You can make vanilla (white sugar) or maple pudding (brown sugar) and add pumpkin pie spice to your taste. Better then instant pudding. Pudding – 2 cups milk, 2 eggs, 1/3 to 1/2 cup of sugar (to your taste), 2 tablespoons of cornstarch, vanilla (2 teaspoons), pumpkin pie spice to taste.. Mix sugar, cornstarch together in saucepan, add eggs, mix well, add milk and bring to a boil over medium heat stirring constantly. Take off burner when thick, mix well. ADD PUMPKIN PIE SPICE, VANILLA AND 1 TABLESPOON OF BUTTER. Mix well. Cool 10 minutes on counter. Fill pie shell. this is the same recipe used for pudding, and graham wafer pie. Around here (in NC) the pumpkin spice pudding is only found between Thanksgiving & Christmas. Have you used other flavors like chocolate or strawberry? I haven’t used them yet Mama, but I plan to. Any flavor will work. It sounds like a lovely idea, but my family is not too keen on pie crusts, unless its the fun ones (chocolate, graham cracker.) Does this taste like old-fashioned crust, or more like the cake-mix you use? I’m not sure what you mean by old fashioned crust. It does not take like pie dough. It does have the flavor of the cake mix. 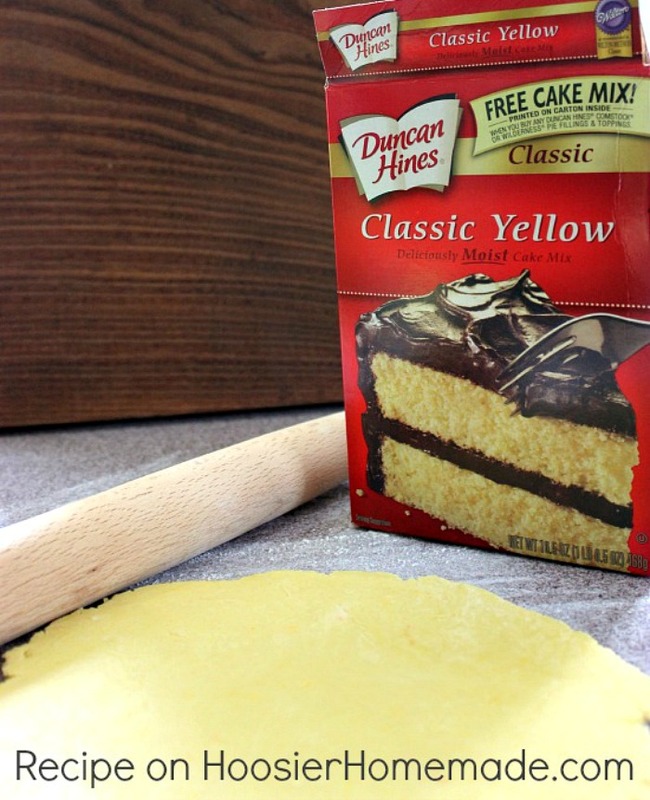 Wow, this is really a great use for a cake mix. Can you tell me, however, if I bake it before I add the pie filling, and then bake it again, does it dry out or even burn. For example, apple pies take at least an hour to bake. Would you adjust for this or would you just use it for “non-bake” pies? Hi Cynthia, this crust is meant to be used with pre-baked pies. I did put it make in the oven for about 3 minutes to heat the meringue, but it did get darker. I would recommend pies like cheesecake or pudding filling. Did you try it with the GF cake mix? How did it turn out? Hi Christi, I have not tried it with a gluten free cake mix yet. Are the pie crusts made with cake mix only for fillings that do not have to be baked. If I want to make an Apple pie that takes an hour to bake, can I use cake mix pie crusts? Or lemon meringue pies? Yes Dale, this pie crust is a pre baked shell. So only fillings are added to the pie crust. If you bake it twice, it will turn too brown. And if it’s not baked first, then it gets soggy. What a great idea! I’m going to have to try it. Thanks Joan! Let me know if you give it a try. I love anything made with cake mix! 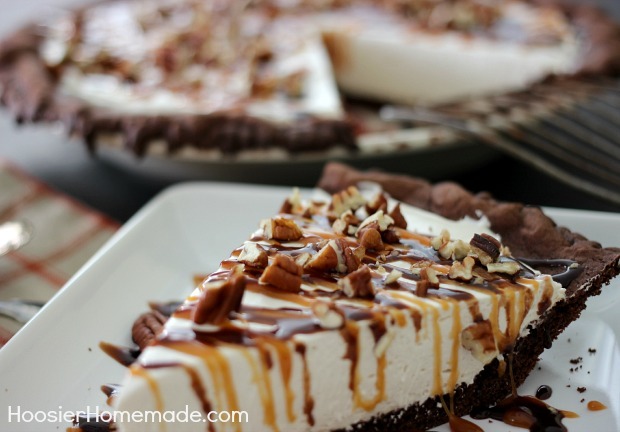 This would be awesome with a certain snickers apple pie I’m planning to make on Thanksgiving!! Hi Karleen, I have not tried it with a gluten free cake mix, but you could certainly try.